The photo is pure, aversive Donald. He’s stood out by not assuming the pose. In spite of the crazy, a lot of people out there not only identify with that, but see it as redeeming. Mark Peterson isolates on the same quality for MSNBC. And it’s even more effective at this angle because it’s so singular, and can also seem confiding. Call it Romney-esque. 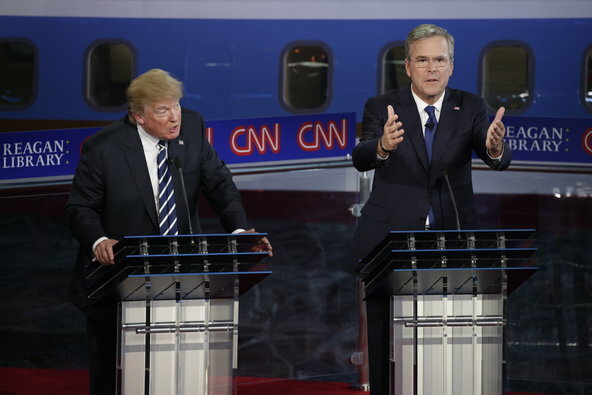 Next to Trump, Bush looks like a guy trying out for the role of himself. And he thought he’d spend the campaign being compared, side-by-side, with his brother and his Dad. What I’ll remember from this campaign is how Trump put Bush away early with the low energy remark. Forevermore, Bush showing vigor (because he is that flat) is going to stand out as compensating. Carson’s soft spoken approach was working fine on the campaign trail the past two weeks. He had no antidote for this defoliant, however. …More specifically, though, his slow and vague responses last night reflected his inability to handle the speed and intensity of a full-on presidential campaign. You can call Trump a goof, but he’s a pro. And what he’s more practiced at than anything is playing off someone’s earnestness. Not that we knew she would burst his bubble, but Wednesday night had been predestined as the Donald – Carly show. I love the symmetry of this screenshot. The race rebalanced (with momentum moving as you see), the GOP (counting Mittens) has been taken over by CEO’s. I thought the most daring decision of the night, by the way, was Fiorina’s choice to come out in dark blue, downplaying her gender. With her strong performance, it more firmly accentuated her viability. … And, it made Trump look that much more smarmy for his misogyny. Having spent weeks trying to bring up his Christy-ness to Trump level, he did seem to be benefit by playing up the Jersey while toning down the nasty. And yeah, it’s cartoony. Seems your don’t stay on the island, though, without establishing yourself as some kind of character. Sen. Marco Rubio of Florida jokes that he brought his own water to drought-stricken Florida. Right, but the photo is as much, or more, about that response to Obama’s State of the Union where he was so nervous, he was fumbling for the Poland Spring. Politically, Marco seemed well hydrated last night. Perhaps the most significant difference between last night’s debate and the previous encounter, as big as the difference between FOX and CNN, was the more sedate audience of well-heeled Orange County types. In contrast to the tone in the cavernous arena in Cleveland, last night’s event pulled for a little more class. Finally, I appreciated Justin Sullivan’s photo for Getty as something of a prediction. The way he captures The Donald suggests the guy might actually have the audacity … to tone it down.